Facebook’s Ads Manager reporting offers an overwhelming number of metrics to marketers, which can make it confusing when trying to evaluate your ad performance. 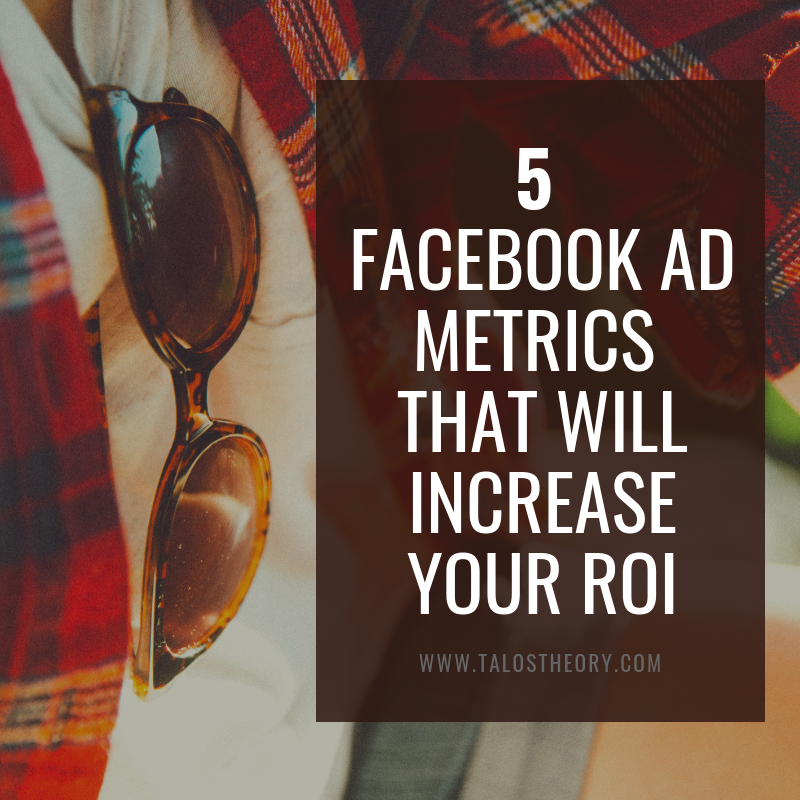 Most marketers only use a handful of these metrics and despite the depth of metrics available, Facebook doesn’t have some of the response rate metrics, such as conversion rate, which is vital to understanding how people are taking actions on your website. To help you better understand the effectiveness and impact of your Facebook ads, here are the essential metrics every Facebook advertiser should understand, especially when trying to drive bottom-funnel actions, or conversions. Put simply, impressions are the number of times your ad is shown. More impressions may lead to higher brand awareness for your company, but impressions don’t necessarily correspond to any action or engagement - just because your ad was shown in someone’s feed, doesn’t necessarily mean they necessarily saw it. While impressions is a metric every advertiser should understand, a better measurement for brand awareness tactic across Facebook would be engagements or link clicks, which are more premium actions taken and goals we optimize towards. We typically look at impressions as a last measure of “what went wrong” after reviewing engagement and click metrics. Facebook has multiple click metrics, “Clicks (All)”, which is defined as the number of times your ad is clicked on (including photo clicks, video plays, etc. ), and “Link Clicks”, which is the number of clicks on links within the ad that led to destinations or experiences, on or off Facebook. Always use the Link Clicks metric because this is specific to URL clicks and a way to measure customer engagement and level of interest. The number of link clicks tells you how many times people came to your website because of your ads. Put link clicks in context by measuring the number of clicks divided by the number of impressions, or the click-through rate (CTR). The higher the CTR, the more interested people are in your ad. Also look at the cost per link click (CPC) of your ads. If your objective is to drive as much interest as possible at the cheapest cost, you want to spend more on ads with lowers CPCs. Remember that the placement of your ad makes a big difference on your CTR and CPC. Ads shown in the news feed generally have higher CTRs and higher CPCs than those in the right-hand column. News feed ads are larger in size and mixed in with a user’s organic content. Many people may click on news feed ads without realizing they are even ads. Keep in mind that clicks are just a proxy for interest. Even if someone is interested in your product, they may not click on your ad because they are averse to doing so. Instead, they may view your ad and visit your website at a later time. This is the number of times a person clicked on an ad link and then successfully loaded the destination webpage or Instant Experience. To report on landing page views, you must have created a Facebook pixel. This metric is takes a deeper dive into the actual response rate of Link Clicks since it measures the full page load. As mentioned above, many people may click on a news feed ad unintentionally and quickly close the new browser window that is automatically opened when I link is clicked, causing them to never actually see the landing page that you’re trying to drive traffic to. If your problem is, “I’m getting a lot of link clicks, but no sales” compare your Landing Page Views to Link Clicks for a better understanding of how people are responding to the ad. Conversions refer to actions taken on your website. This could mean different things to different businesses. In general, it refers to the desired action you want to take place. For example, it could refer to adding a product to a cart, checking out or entering an email address. Put conversions in context by measuring the number of conversions divided by the number of link clicks, known as the conversion rate. Your conversion rate indicates how likely it is that a site visitor will take the desired action. When considering what to advertise, choose products that have a high conversion rate. Also, keep in mind that a higher CTR does not equate to a high conversion rate. A metric that many marketers use to determine advertising effectiveness is the advertising spend divided by the number of conversions, or cost per action/acquisition (CPA). The lower the CPA, the more conversions you are getting for less. When looking at conversion metrics, make sure to acknowledge the source. If a user receives an email from you, he or she is already familiar with your product and is more likely to take an action than a brand new customer. A user coming from a Facebook ad may be less familiar with your product and will likely have a lower conversion rate. Return on ad spend (ROAS) is defined as revenue divided by advertising spend. This metric should be used for advertisers looking to drive sales immediately. The higher the return on ad spend, the better. Most advertisers look to at least break even on their advertising campaigns with a ROAS greater than 100%. If you look at lifetime value, though, you can afford to have a lower ROAS target. When evaluating your ROAS results, make sure to consider your advertising budget and click volume. We recommend getting at least 100 clicks on an ad before assessing your ROAS performance. Keep in mind that if your goal is to build brand awareness or drive engagement, ROAS should not be their primary metric. Revenue is important, but new customers from a branding campaign are just starting to learn about your business. It will take time to nurture their interest before they make a purchase.